Peel and finely chop the onions, crush the garlic. Grate the ginger and chop the tomatoes. Heat 2 Tablespoons of oil in a frying pan and, when it’s almost smoking, add the mustard seeds, the fenugreek, ginger and the curry leaves. Fry for a few seconds, then add the onion and the garlic and cook over a medium heat until golden. Add the chilli powder, coriander and turmeric, and stir for a few seconds. Add the tomato and tamarind. Simmer until slightly reduced and you can start to see oil separating from the sauce. Add a few tablespoons of water to get the sauce back to the consistency it was before, season with sea salt. Simmer until the sauce is quite dry. 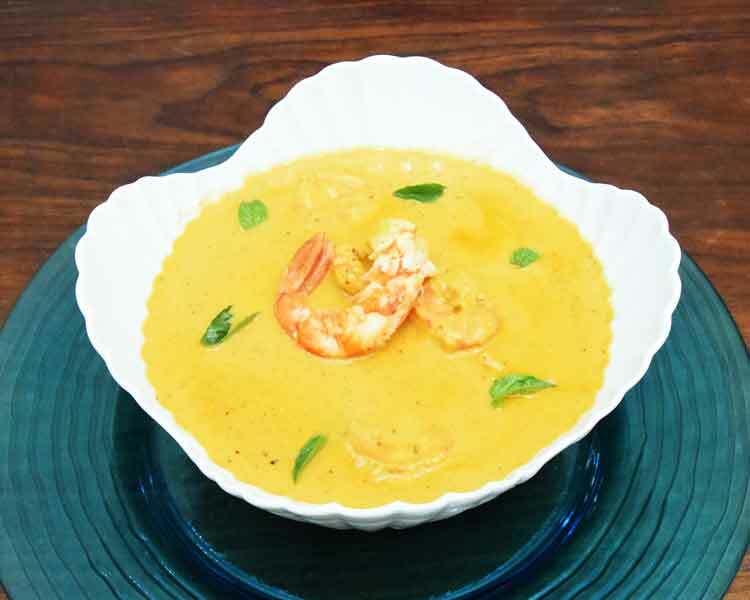 Then add the coconut milk and the prawns; bring back to boil and turn the heat down to low till the prawns are cooked. Taste and adjust the seasoning. This makes quite a chunky curry. If you want it smooth, and we do, just put in your stick blender and blitz to the desired consistency BEFORE you add the prawns. They only take a minute or two to cook. In another pan, heat 1 tablespoon of oil, the chillies and remaining mustard seeds and curry leaves. Fry for 10 seconds or so, then tip into the curry. Serve with steamed rice, some atchars and a sweet chutney which will temper the tartness that the tamarind brings.